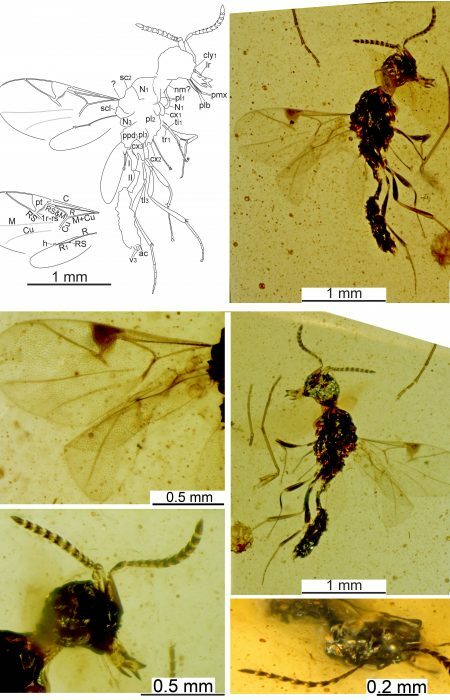 Once more, an unexpected fossil insect has been discovered in fossil amber from Myanmar — commonly called Burmese amber. 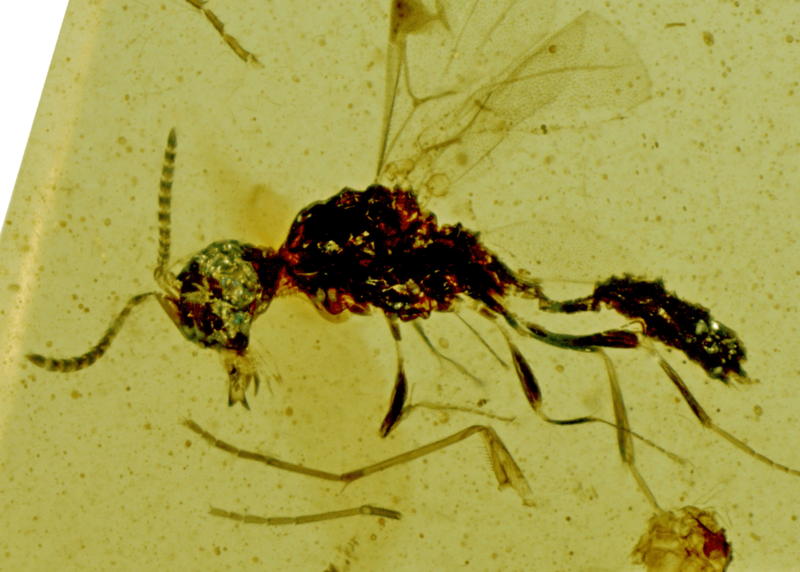 The wasp, which now was described as Supraserphites draculi gen. sp. nov. (see Fig. 1), shows characteristics of two different families, Serphitidae and Archaeoserphitidae. Because of several characteristics common with Serphitidae, the new genus has been placed in this family, however, due to several strong differences (f. ex. antenna with 10 instead of up to 8 flagellomeres, very long maxillary and labial palpi of subequal length, and a more complete wing venation), a new subfamily had to be created, Supraserphitinae, and the diagnosis of Serphitidae has accordingly been amended. The only other serphitoid family, Archaeoserphitidae, also displays common morphological features with the new wasp. For example, Archaeoserphitidae display two petiolar segments of subequal length, head details, such as antenna placed high above mandibles and subvertical position of the clypeus, and larger numbers of flagellomeres compared to other Serphitoidae. These new findings show that delimitations of taxa in Serphitoidea are rather unclear and that the group might require a future revision. The large mandibles of the new wasp species — the only known species of this new subfamily so far — and its generally strange morphology gave the reason for choosing the new species name, Supraserphites draculi, referring to Count Dracula. Similar to a vast number of other recently discovered new families and orders, this wasp is only known from the Burmese amber assemblage, therefore, it very likely is endemic to the West Burma plate, which again suggests that the biota were geographically isolated at the time, and that the plate collided at a later time with the proto-Southeast-Asian mainland (also see: Alexandr Rasnitsyn and Christoph Öhm-Kühnle: Three new female Aptenoperissus from mid-Cretaceous Burmese amber (Hymenoptera, Stephanoidea, Aptenoperissidae): Unexpected diversity of paradoxical wasps suggests insular features of source biome, in Cretaceous Research 91, 168-175, https://doi.org/10.1016/j.cretres.2018.06.004). Alexandr Pavlovich Rasnitsyn is a Russian entomologist, expert in palaeoentomology, and Honored Scientist of the Russian Federation (2001). His scientific interests are centered on the palaeontology, phylogeny, and taxonomy of hymenopteran insects and insects in general. He has also studied broader biological problems such as evolutionary theory, the principles of phylogenetics, taxonomy, nomenclature, and palaeoecology. He has published over 300 articles and books in several languages. In August 2008 he was awarded the Distinguished Research Medal of the International Society of Hymenopterists. Christoph holds two doctoral degrees and teaches musicology at Tubingen University and also is the author of historical novels and scientific studies and publications (on the evolution of Hymenoptera). He is a member of the Royal Entomological Society and founded a collection of insect fossils which is maintained at the Russian Academy of Sciences, Moscow.